Bad circumstances: God is in control. Who wouldn’t be grateful for having a sovereign God who is in control of every situation, despite the bad circumstances that is happening? Yesterday, I parked my car in Rockwell and bought some stuffs with a friend. 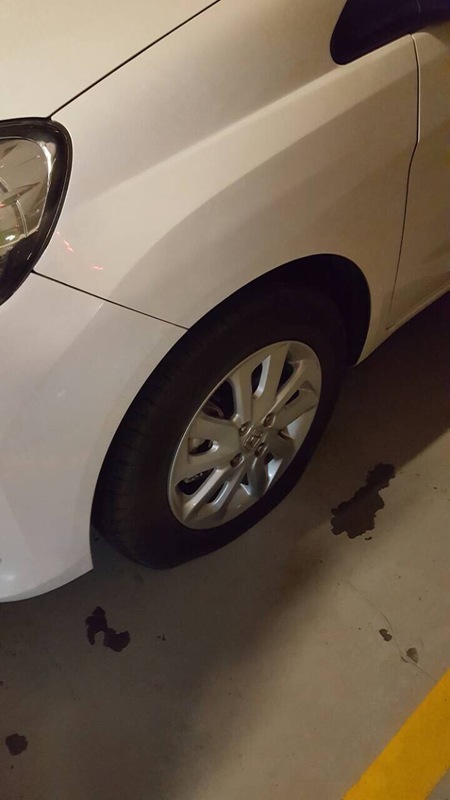 When we went back to my car, I noticed that my front tire was flat. My friend told me that someone might have mistakenly hit Saber so we sought the help of the Admin folks if they can review the cctv, but at the back of my head, I’m praying to God that no one did this. So the mall admin went with me to my car, asked to have the cctv be reviewed, offered to arrange someone to bring me home if in case my car wont get fixed and called two guards to assist me change my tire. Then, 2 more admin on duty followed to offer additional help to me in whatever possible way they can and even had my parking fee waived. How about that? Thankfully that I had a spare tire and some tools at the back of my car, the guards helped me changed my tire and found out there’s a barb wire that hit my tire and gladly no one tried to do something with Saber. Praise God for His graces that I don’t deserve. He kept me safe until I find shelter in a secured parking lot and sending very accommodating and very helpful people. No one’s hurt and had my tire vulcanized with no further damage at a very low price. Isn’t God an amazing God? PS: Kudos to all Rockwell Power Plant Admin staff and guards. You have been all very helpful and I can’t thank you enough.